Owly Baby: Darling Cardigan Sewing Pattern! YIKES - I'm so excited! The new pattern is finally here! It's available for testing now, so if you're interested please leave a comment on this blog post with your email address and the size(s) you'd like to test. Update: TESTING IN NOW CLOSED. Thanks so much to all my fabulous testers!! There are 2 styles to choose from - the grandpa cardigan and the exposed zipper cardigan. Instructions for both are included in the pattern. These cardigans will put a sweet spin on any outfit. Inspired by grandpa’s closet and grandmas ruffled pillow - these two styles are sure to keep your little ones warm. Pattern includes full instructions to make both styles, how to apply ribbing, sewing an exposed zipper and more! With so many options to choose from - you’ll use this pattern over and over! 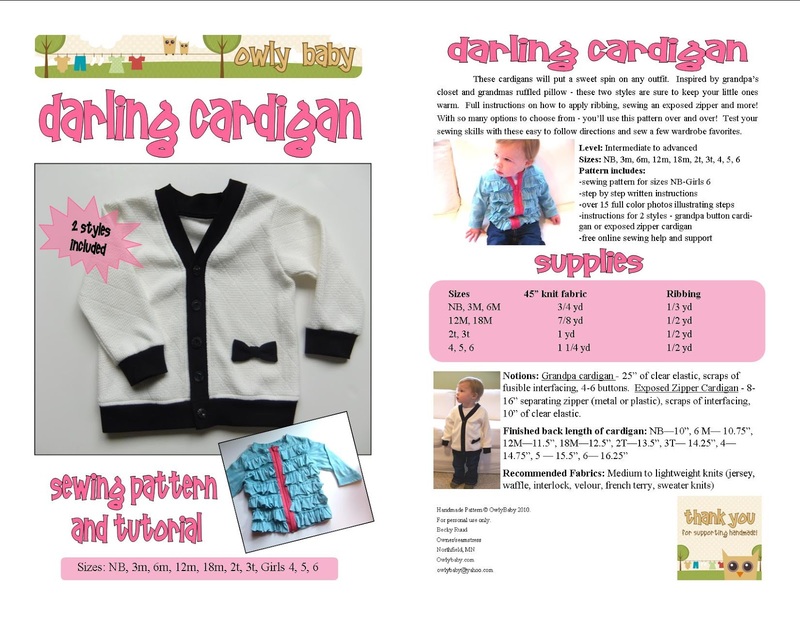 Description: The Darling Cardigan PDF pattern is a digital file that includes full size print-at-home pattern pieces and step by step sewing instructions with full color photos. The pattern is made for medium to lightweight knit fabrics (interlock knit, waffle knit, jersey, velour, french terry, etc...). Instructions and pattern pieces for both styles (grandpa ribbed button cardigan and exposed zipper with/without ruffles) are included. INTERESTED IN TESTING THE PATTERN? Testing in now closed. Thanks so much! Post a comment on this blog post with your email address and the size you'd like to test. -You will receive the full file with all sizes included, but I would like to make sure I've tested all sizes. -You will also receive a word document with questions for pattern review. -Please try to sew and review the garment within one week of receiving the file. Note: This is the first test version of the pattern and instructions - there will likely be mistakes. Thank you for your patience! I'd love to test the grandpa cardigan size 6mo! I would love to test this pattern in 3 months, 6 months, 2t and 4t. I've got a couple gifts to make and I'd love some cute matching cardigans for my own girls! Great! Let me know your email addresses in the comment (or email me at owlybaby@yahoo.com) and I'll send it to you pronto! Thanks Erica! I've just sent it over to you. I would like to test the size 6.